Kahoʻolawe ( /kɑːˌhoʊoʊˈlɑːweɪ, -veɪ/ ; Hawaiian: [kəˈhoʔoˈlɐve]) is the smallest of the eight main volcanic islands in the Hawaiian Islands. Kahoʻolawe is located about seven miles (11 km) southwest of Maui and also southeast of Lānaʻi, and it is 11 mi (18 km) long by 6.0 mi (9.7 km) wide, with a total land area of 44.97 sq mi (116.47 km2). The highest point on Kahoʻolawe is the crater of Lua Makika at the summit of Puʻu Moaulanui, which is about 1,477 feet (450 m) above sea level. Kahoʻolawe is relatively dry (average annual rainfall is less than 65 cm or 26 in)  because the island's low elevation fails to generate much orographic precipitation from the northeastern trade winds, and Kahoʻolawe is located in the rain shadow of eastern Maui's 10,023-foot-high (3,055 m) volcano, Haleakalā. More than one quarter of Kahoʻolawe has been eroded down to saprolitic hardpan soil, largely on exposed surfaces near the summit. Aerial photo of Kahoʻolawe. In the background is Mount Haleakala on Maui. Kahoʻolawe has always been sparsely populated, due to its lack of fresh water. During World War II, Kahoʻolawe was used as a training ground and bombing range by the Armed Forces of the United States. After decades of protests, the U.S. Navy ended live-fire training exercises on Kahoʻolawe in 1990, and the whole island was transferred to the jurisdiction of the state of Hawaii in 1994. The Hawaii State Legislature established the Kahoʻolawe Island Reserve to restore and to oversee the island and its surrounding waters. Today Kahoʻolawe can be used only for native Hawaiian cultural, spiritual, and subsistence purposes. Kahoʻolawe experiences a semi-arid climate ( Köppen BSh). Sometime around the year 1000, Kahoʻolawe was settled by Polynesians, and small, temporary fishing communities were established along the coast. Some inland areas were cultivated. Puʻu Moiwi, a remnant cinder cone,  is the location of the second-largest basalt quarry in Hawaiʻi, and this was mined for use in stone tools such as koʻi ( adzes). Originally a dry forest environment with intermittent streams, the land changed to an open savanna of grassland and trees when inhabitants cleared vegetation for firewood and agriculture. Hawaiians built stone platforms for religious ceremonies, set rocks upright as shrines for successful fishing trips, and carved petroglyphs, or drawings, into the flat surfaces of rocks. These indicators of an earlier time can still be found on Kahoʻolawe. While it is not known how many people inhabited Kahoʻolawe, the lack of freshwater probably limited the population to a few hundred people. As many as 120 people might have once lived at Hakioawa, the largest settlement, which was located at the northeastern end of the island—facing Maui. From 1778 to the early 19th century, observers on passing ships reported that Kahoʻolawe was uninhabited and barren, destitute of both water and wood. After the arrival of missionaries from New England, the Kingdom of Hawaiʻi under the rule of King Kamehameha III replaced the death penalty with exile, and Kahoʻolawe became a men's penal colony sometime around 1830. Food and water were scarce, some prisoners reportedly starved, and some of them swam across the channel to Maui to find food. The law making the island a penal colony was repealed in 1853. A survey of Kahoʻolawe in 1857 reported about 50 residents here, about 5,000 acres (2,000 ha) of land covered with shrubs, and a patch of sugarcane growth. Along the shore, tobacco, pineapple, gourds, pili grass, and scrub trees grew. Beginning in 1858, the Hawaiian government leased Kahoʻolawe to a series of ranching ventures. Some of these proved to be more successful than others, but the lack of freshwater was an unrelenting enemy. Through the next 80 years, the landscape changed dramatically, with drought and uncontrolled overgrazing denuding much of the island. Strong trade winds blew away most of the topsoil, leaving behind red hardpan dirt. From 1910 to 1918, the Territory of Hawaii designated Kahoʻolawe as a forest reserve in the hope of restoring the island through a revegetation and livestock removal program. This program failed, and leases again became available. In 1918, the rancher Angus MacPhee of Wyoming, with the help of the landowner Harry Baldwin of Maui, leased the island for 21 years, intending to build a cattle ranch there. By 1932, the ranching operation was enjoying moderate success. After heavy rains, native grasses and flowering plants would sprout, but droughts always returned. In 1941, MacPhee subletted part of the island to the U.S. Army. Later that year, because of continuing drought, MacPhee removed his cattle from the island. Operation "Sailor Hat", 1965, the detonation of the 500-ton TNT explosive charge for test shot "Bravo", first of a series of three test explosions on the southwestern tip of Kahoʻolawe Island, Hawaii, February 6, 1965. Military and naval training on Kahoʻolawe continued following World War II. During the Korean War, warplanes from aircraft carriers played a critical role in attacking enemy airfields, convoys, and troop staging areas. Mock-ups of airfields, military camps, and vehicles were constructed on Kahoʻolawe, and while pilots were preparing for war at Barbers Point Naval Air Station on Oʻahu, they practiced spotting and hitting the mock-ups at Kahoʻolawe. Similar training took place throughout the Cold War and during the War in Vietnam, with mock-ups of aircraft, radar installations, gun mounts, and surface-to-air missile sites being placed across this island for pilots and bombardiers to use in their training. In 1976, a group of individuals calling themselves the Protect Kahoʻolawe ʻOhana (PKO) filed suit in U.S. Federal Court to stop the Navy's use of Kahoʻolawe for bombardment training, to require compliance with a number of new environmental laws and to ensure protection of cultural resources on the island. In 1977, the U.S. District Court for the District of Hawaii allowed the Navy's use of this island to continue, but the Court directed the Navy to prepare an environmental impact statement and to complete an inventory of historic sites on the island. The effort to regain Kaho‘olawe from the U.S. Navy began as a new wave of political awareness and activism was inspired within the Hawaiian community. Charles Maxwell and other community leaders began to plan a coordinated effort to land on the island, which was still under Navy control. The effort for the "first landing" began in Waikapu (Maui) on January 5, 1976. Over 50 people from across the Hawaiian islands, including a range of cultural leaders, gathered on Maui with the goal of "invading" Kahoʻolawe on January 6, 1976. The date was selected because of its association with the United States' bicentennial anniversary. In 1990, President George H. W. Bush ordered an end to live-fire training on the island. The U.S. Department of Defense Appropriations Act for Fiscal Year 1991 established the Kahoʻolawe Island Conveyance Commission to recommend terms and conditions for the conveyance of Kahoʻolawe from the U.S. government to the state of Hawaii. In 1993, Senator Daniel Inouye of Hawaii sponsored Title X of the Fiscal Year 1994 for the Department of Defense appropriation bill, directing that the U.S. government to convey Kahoʻolawe and its surrounding waters to the state of Hawaii. Title X also established the objective of a "clearance or removal of unexploded ordnance (UXO)" and the environmental restoration of the island, to provide "meaningful safe use of the island for appropriate cultural, historical, archaeological, and educational purposes, as determined by the State of Hawaii." In turn, the Legislature of Hawaii created the Kahoʻolawe Island Reserve Commission to exercise policy and management oversight of the Kahoʻolawe Island Reserve. As directed by Title X and in accordance with a required memorandum of understanding between the U.S. Navy and the state of Hawaii, the Navy transferred the title to the land of Kahoʻolawe to the state of Hawaii on May 9, 1994. As required by Title X, the U.S. Navy retained access control to the island until the clearance and environmental restoration projects were completed, or until November 11, 2003, whichever came first. The state agreed to prepare a use plan for Kahoʻolawe and the Navy agreed to develop a cleanup plan based on that use plan and to implement that plan to the extent Congress provided funds for that purpose. In July 1997, the Navy awarded a contract to the Parsons/UXB Joint Venture to clear unexploded ordnance from the island to the extent funds were provided by Congress. After the state and public review of the Navy cleanup plan, Parsons/UXB began their work on the island in November 1998. In 1993, the Hawaiian State Legislature established the Kahoʻolawe Island Reserve, consisting of "the entire island and its surrounding ocean waters in a two mile (three km) radius from the shore". By state law, Kahoʻolawe and its waters can be used only for Native Hawaiian cultural, spiritual, and subsistence purposes; fishing; environmental restoration; historic preservation; and education. All commercial uses are prohibited. Irrigation tubing running atop the red soil of Kahoʻolawe as a crew works to plant new life in the hard-packed ground. The boundaries of all but the two westernmost ʻili converge on the crater rim of Lua Makika, but do not include it. The crater area of Lua Makika is not considered an ʻili and does not belong to any ʻili. ^ "Kahoʻolawe". Kumukahi. Retrieved 2018-03-06. ^ Shearer, Barbara Smith (2002). "Chapter 6 - State and Territory Flowers". State Names, Seals, Flags, and Symbols: a Historical Guide (3 ed.). Greenwood Publishing Group. p. 99. ISBN 978-0-313-31534-3. ^ "Kahoolawe" (PDF). Hawaii's Comprehensive Wildlife Conservation Strategy. 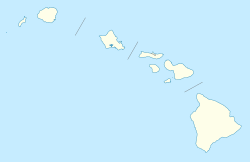 Hawaii Division of Land and Natural Resources. ^ Sherrod, David R.; Sinton, John M.; Watkins, Sarah E.; Brunt, Kelly M. (2007). Geologic Map of the State of Hawai‘i, Sheet 6—Island of Kaho‘olawe (PDF). USGS. ^ Sherrod, David R.; Sinton, John M.; Watkins, Sarah E.; Brunt, Kelly M. (2007). Geologic Map of the State of Hawai‘i (PDF). USGS ; Open-File Report 2007-1089. ^ "KAHOOLAWE 499.6, HAWAII (512558)". Western Regional Climate Center. Retrieved March 21, 2018. ^ "NOWData - NOAA Online Weather Data". National Oceanic and Atmospheric Administration. Retrieved March 23, 2018. ^ Macdonald, Gordon Andrew; Agatin Townsend Abbott; Frank L. Peterson (1983). Volcanoes in the Sea: the Geology of Hawaii (2 ed.). University of Hawaii Press. p. 401. ISBN 978-0-8248-0832-7. ^ McGregor, Davianna (2007). "Chapter 6 - Kahoolawe: Rebirth of the Sacred". Nā Kuaʻāina: Living Hawaiian Culture. University of Hawaii Press. p. 253. ISBN 978-0-8248-2946-9. ^ "Population Trends on Kahoolawe" (PDF). Census.gov. Retrieved March 23, 2018. ^ Fornander, Abraham (1880). An Account of the Polynesian Race: Its Origins and Migrations, and the Ancient History of the Hawaiian People to the Times of Kamehameha I. London: Trübner & Co. pp. 156–157. ^ Sarhangi, Sheila (November 2006). "Saving Kahoolawe". Honolulu Magazine. PacificBasin Communications. ^ Luci Yamamoto (2006). Kaua'i. Lonely Planet. p. 35. ISBN 978-1-74059-096-9. ^ Mooallem, Jon (May 8, 2013). "Who Would Kill a Monk Seal?". The New York Times. Retrieved June 15, 2014. ^ "Navy Concludes Operations on Hawaiian Island of Kaho'olawe". From Commander, Navy Region Hawaii Public Affairs. U.S. Navy. April 16, 2004. Retrieved September 19, 2011. ^ a b "Stewardship Agreement" (PDF). Kahoʻolawe Island Reserve USGS Open File Reports. Kahoʻolawe Island Reserve Commission. April 7, 2009. Retrieved September 19, 2011. ^ Enomoto, Kekoa Catherine (February 17, 2008). "Volunteers visit regreened Kahoolawe". The Maui News. Retrieved November 29, 2016. ^ "Native Hawaiian Land Division - Haleakalā National Park". Nps.gov. Retrieved 2012-06-17. ^ Aha Kiole Advisory Committee (2008-12-29). "Report to the Twenty-Fifth Legislature, 2009 Regular Session, Final Report" (PDF). p. 43. Archived (PDF) from the original on 2018-04-05. Retrieved 2018-04-05. Coffman, Tom (2003). The Island Edge of America: A Political History of Hawai'i. University of Hawaii Press. ISBN 0-8248-2662-0. Levin, Wayne; Roland B. Reeve (1995). Kaho'olawe Na Leo O Kanaloa: Chants and Stories of Kaho'olawe. ʻAi Pohaku Press. ISBN 1-883528-01-1. MacDonald, Peter (1972). "Fixed in Time: A Brief History of Kahoolawe". Hawaiian Journal of History. Honolulu: Hawaiian Historical Society. 6: 69–90. hdl: 10125/6328. Napier, A. Kam (November 2006). "On Kahoʻolawe". Honolulu Magazine. PacificBasin Communications. Ritte, Jr., Walter; Sawyer, Richard (1978). Na Manaʻo Aloha o Kahoʻolawe: Hawaiʻi Warriors Love for Land and Culture. Honolulu, HI, USA: Aloha 'Aina o na Kupuna, Inc. ASIN B0006Y07P8. OCLC 8661294. Sano, H; Sherrod, D; Tagami, T (2006). "Youngest volcanism about 1 million years ago at Kahoolawe Island, Hawaii". Journal of Volcanology and Geothermal Research. PacificBasin Communications. 152 (1–2): 91–96. Bibcode: 2006JVGR..152...91S. doi: 10.1016/j.jvolgeores.2005.10.001. Tavares, Hannibal M.; Noa Emmett Aluli; A. Frenchy DeSoto; James A. Kelly; H. Howard Stephenson (1993). Kaho'olawe Island: Restoring a Cultural Treasure. Final Report of the Kaho'olawe Island Conveyance Commission to the Congress of the United States. Kaho'olawe Island Conveyance Commission. Wikimedia Commons has media related to Kahoʻolawe.